VEA General Assembly Daily Reports: Did You Hear Her? The Charter School Constitutional Amendment Is Dead! Did You Hear Her? The Charter School Constitutional Amendment Is Dead! 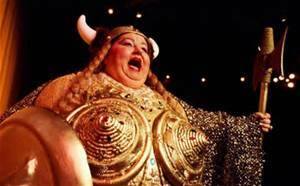 The sweet sound of Der Ring des Nibelungen engulfed the Capital, and Brünnhilde sang! It is over! A curious aspect of this session is that early in the session the media reported that the charter school constitutional amendment was sure to pass. Perhaps, the pro-public education lobby was underestimated. Subsequently, the press has continued to report that the amendment was dead when only the Senate's amendment bill had failed. In fact, the General Assembly made the final decision today when the Senate Privileges and Elections Committee failed to report HB3 and HJ1. Thanks to our coalition partners on this bill, VASS and VSBA! Senator Obenshain's SB734, the bill to implement the changes in the Code of Virginia allowed if the Virginia Constitution is amended as a consequence of passage of the ballot question in November, went by for the day in the Innovation Subcommittee of the House Education Committee this morning. I doubt that the bill will be considered on Tuesday - what's the point now that the constitutional amendment will not be on the ballot. VEA initiated SB564 sponsored by Senator Norment reported from the House Committee on General Laws on a unanimous vote this afternoon. This is the bill to Sheila teacher licensure applications from FOIA requests. This bill now heads to the House floor on the uncontested calendar. Thanks, Senator Norment!